the fence surrounding the tree was a 'find fence' or a lost and found fence. the sign says something along the lines of "find a lost object, add a found one". if you find something that someone has dropped, you can hook it onto the fence. if you've lost something, this might be a great place to look for it after you've done a thorough pocket and ground search. what a great idea. honesty and trust, and so friendly! 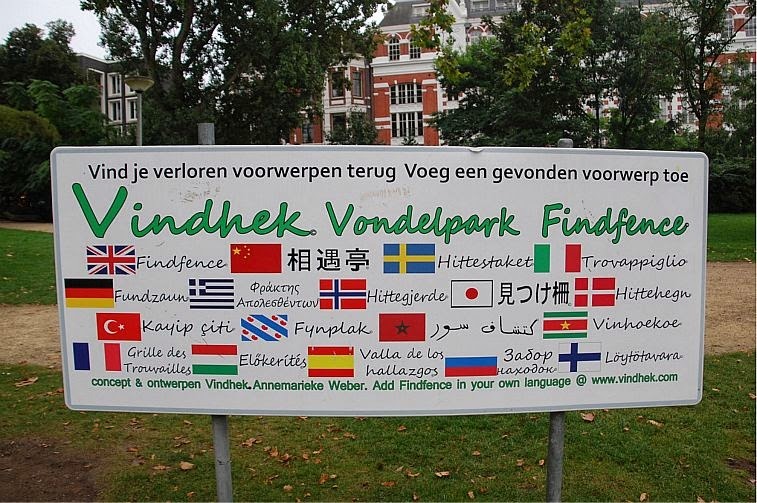 but I wondered about the flags for 18 different languages (English, Chinese, Swedish, Italian, German, Greek, Norwegian, Japanese, Danish, Turkish, Frisian, Moroccan, Surinamese, French, Hungarian, Spanish, Russian, Finnish). I think the idea is to make the fence an interactive experience where you upload a photo onto some social media site and link back to vindhek. I imagine that there would be many lost mittens, scarves, keys etc., in the winter as people constantly put their hands in and out of their pockets. 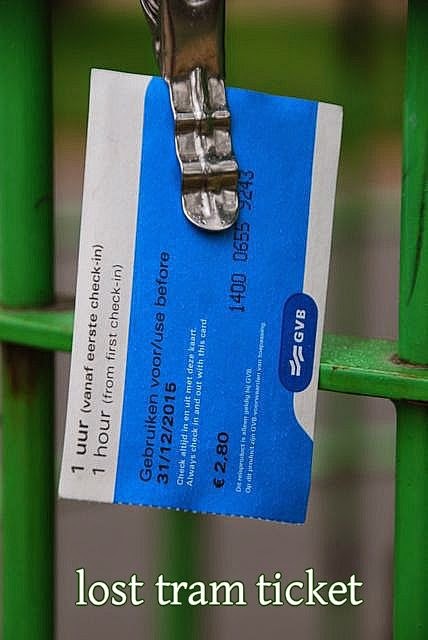 I wonder if any euros have been pinned to the fence?? 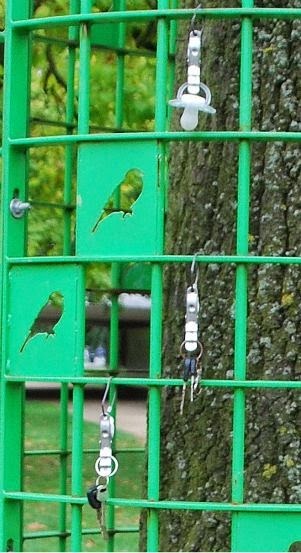 oh, and as an aside, during my research once I got home, I discovered that the birds were special to Amsterdam - they are finches. in Utrecht the birds are robins, and in Amersfoort they are swallows. 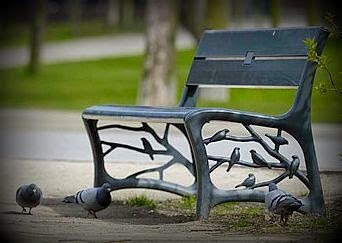 the birds also adorn the benches in the park. I am also linking with a new meme I discovered by Restless Jo for Jo's Monday Walk. Lots of new-to-me-blogs to discover from her meme, so pop on over to see what it's all about. What a great idea...a lost and found fence. It's an awfully big park, so I wonder how far away some of these found objects were found. I was also concerned about so many lost keys! but, yes, a great idea that could be adopted here, perhaps? I'd be seriously tempted to lose something on purpose, just so I could use the fence. :) Nice isn't it? If I lived there, I think I'd be playing along and at least keeping my eye open while out on my daily stroll. I love the idea of a Find Fence! Fun post! Like that lonely little sock. :-) So glad you stopped in today! 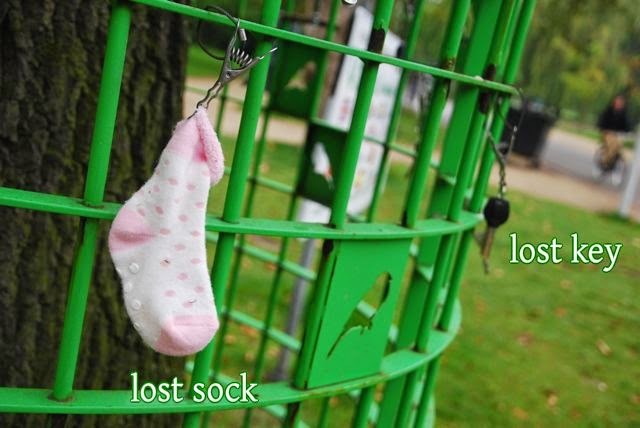 what a novel idea for lost and found! and it makes for an interesting, artsy display too. An interesting idea. 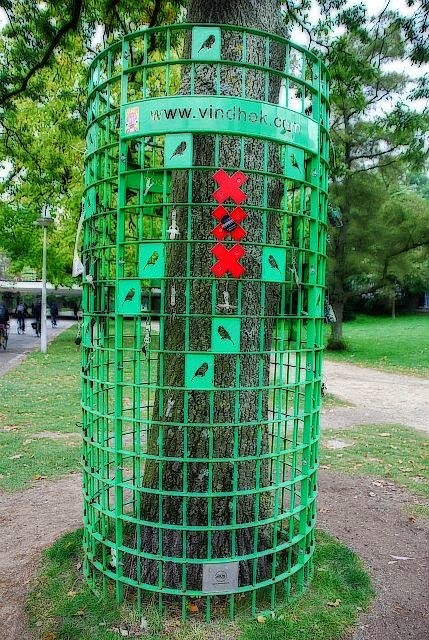 We could do with a feature like that on a tree near our beach foreshore - especially in summer.